I find myself, again, surrounded by a collapsing home. It’s winding itself round with corrugated brown paper, mummified, it tips itself into boxes, disappears into a mountain of cartons. Walls are suddenly naked of paintings, the plaster pockmarked. Rooms echo back at me when I speak, gone are the curtains and the fabrics and the fat cushions that absorbed the sounds. The practicalities of moving are easy now – this is my sixth big move in 8 years – I parcel up glass, fold away my workshop, inhale deeply in my children’s rooms and bundle up too-small clothes and pictures they drew in primary school. But despite the necessary brevity of so many recent homes – 7 or 8 in less than four years – leaving a house is always hard; it marks us with a bit of itself and we inevitably leave a part of ourselves behind. Each home has – as we hung those paintings, positioned tatty, dog-eared, precious-only-for-its-sentimental-history furniture – revealed some of its soul; you can’t help but be moved as you leave. My outpost home was fashioned from a leftover of colonial times, a suburban box that we peeled open with a huge verandah, that we let the light and the air into by knocking its innards out into big flung-wide-welcoming arches. Children came home regularly then; we spilled outwards into a garden over which stood as sentinel the most beautiful flamboyant which, just before the rains, bled red into the pool. My outpost home grew necessarily fat. My beach-side homes, two of them, were loved for their very geography; Ant’s childhood home briefly our children’s, bushbabies that screeched outside my window at night, the push and pull of tide which – when high – woke me from deep sleep, when low kissed the beach gently so that I barely heard it. My two Zambian city homes had characters of such disparity it was small wonder one made me feel at home, one didn’t; the first an austere town house with high ceilings and an unseemly proportion of chrome to wood, ‘this isn’t you, it it’, said Ant sadly when he first brought me back to it. No, I admitted, just as sadly, it’s not. So we moved to one which was as impractical as it was unconventional, but which was much more Me (and Ant); it sat squatly amidst ten acres of bush so – within a spit of the capital – I could wake to the sound of guinea fowl cackling and gossiping at dawn. The little thatched cottage I spent six months in on a mango farm revealed itself as a sanctuary during a time of aloneness and confusion. You could have clambered over the walls, kicked the doors in, friends feared for my safety – security was questionable – but I never felt afraid. I felt cocooned. I sat up too late drinking beer, listening to the palms whisper secrets to the moon as I tried to find the answers to too many dilemmas. And now here. This house. 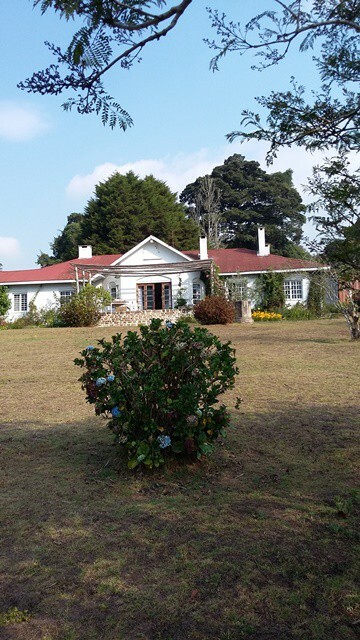 This house in the tea deep in the misty moist mountainous southern reaches of Tanzania, perched above the oldest forests in Africa, from which, at this time of year, comes the gabbling throaty call of the turaco which I see when I walk, flashes of crimson wing. I sit on this last evening on my own by the fire I have lit, as I have so often lit one, to while away lonely hours, to warm the room. To watch the flames. Jip snores at my feet. She came here a puppy. Pili has journeyed to every one of those homes with us; the sight of boxes alarms her less. In the garden, beneath the plum trees lies Scally who faithfully curled at my feet, beneath desks in dozens of homes, for fourteen years. Not far away, I buried another faithful old friend, Orlanda; she’s under the roses. I don’t remember how old she was when she went but she knew even more homes than Scally. She purred contentedly in every one of them. Apart from Jip’s snoring, and the hiss and pop of the fire, the house is quiet. When I go to bed, turn off lights, I know precisely how each switch will give beneath my fingers, I know which doors need a little more encouragement to close, I know how to push the latch of my bedroom window so that it opens wide and the chill of the night settles upon my room so that curling beneath my duvet is especially delicious. Every home is possessed of quirks and whimsy, taps the drip, pipes that gurgle, a floorboard the speaks, a step whose unevenness you have learned to navigate. And I will sleep and the house will breathe and sigh familiar sounds that will be lost soon until I recognize the nighttime noises of my new home. Another colonial relic, another suburban box, which we have hammered open wide and hewn to fit this family and all the boxes that will spill bits of ourselves all over it when they arrive, and all the tired treasures we have insisted in dragging with us on our nomadic adventure; we have added a huge verandah which we know we will live on, we have knocked wide arches through walls to let in the light and air. I never, ever thought that we’d be heading back to the Outpost – how funny that we are? Even funnier, I think, that the prospect delivers not a sense of dread, but a deep peacefulness. This conversation is an old one. And contentious. We are supposed to believe women can Have It All because that’s the dictate of modern feminism, the battle cry of today’s contemporary women; you can have a career, a marriage, children. You can keep all the balls you’re juggling safely up in the air and at evenly spaced distances so you can manage them with predicable and assured tempo. Never dropping a single one. I have never been in any doubt that I’d let at least one slip through my fingers, probably two and quite possibly all three at the same time. Because life isn’t like that, it’s not an easy game squared away with numbers and precision. Having It All means much more than managing your children, your career, your partnership. It means remembering to have a leg wax, plucking your eyebrows, buying dog food. It means not forgetting a friend’s birthday and making note to self to pay health/house/car insurance. It means making a choice: nativity play or conference call? It might mean, at some point, assuming some responsibility for a parent. You can’t be sure how many balls you’re going to need to keep up in the air at any one time, another can easily be chucked in, quite unexpectedly. In the past month, my husband has started a new job, we are obliged to renovate a new home (which was gutted and the roof ripped off), two of my children began at new universities, I had a magazine to edit. And then my mum had a stroke. Had I had a real career (as opposed to a part time job I can do in my pajamas, from bed, at 2am if needs be – a job I can farm bits of out to a budding journalist daughter) I’d have dropped balls, for sure. As it was I had to run my eye down a pressing list of priorities, each jostling for attention. And I had to acknowledge that not only could I not Have It All, I could only have a really small bit of it. And so my husband embarked on a new job without my presence or any support from me bar the very rare text, hope all going well, love you; the renovation has taken – sometimes – an interesting and unexpected shape, squat loos for western style ones (I did manage to effect a turnaround there), peppermint green exterior walls instead of off-white (that we’ll have to live with). My son began his fourth year at a new university in London and had to secure a place to live. I could lend no support, only solace when he miserably called to tell me he had been shown yet another London broom cupboard at hundreds of pounds a month – all I could offer were spareroom.co.uk links to the next broom cupboard. Hat began university and I could not be there to take her, to help her unpack, to admire her new room. Instead I funded her big sister to accompany her, unpack her, tell her it would all be alright. And – as I say – I farmed out much of the editing to the same new student who leapt at the chance to supplement her allowance. And whilst they all got on – mostly perfectly well – without me (bar those loos, of course), I sat in a rehab facility in a beautiful city and coaxed my mum to break down short words, letter by letter, and celebrated with her when she managed to link them up as language. That, then, for those weeks, was the most important thing to do, the thing on my list that demanded the most urgent attention. And it was all I could do; there just wasn’t enough of me to go around. Spread thinly, that’s the best I could manage. And that might be a kinder, more forgiving mantra to live by; do the best you can do with whatever you do do. Dublin’s 40 shades of green are swiftly and softy warming to myriad shades of mellowness; the virigina creeper that clings to and clambers up dozens of the city’s elegant buildings morphs at one end from saffron yellow to chilli red at the other. We’re having an indian summer, the Irish say, and they laugh, ‘we’ll take all the summer we can get’. I am here because Mum has had a stroke. Each day I drive through this warm city wallowing in the kaleidoscope of mid season tones, I notice its coat of many colours has changed again, subtly, but changed; the green less acid, the yellow deeper, the red burnished. So many emotions flow. Deep sadness that mum is ill. Determination that we get her well. Fury, indignation, outrage that one monster sickness should barge its way in just as another steps aside. Depression had ranted, nagged, niggled for almost two years. Was the interior blow to her brain too big to give depression the space to stay. I would like to think as much. But the same strike (I did not know where the word, in its context of cerebrovascular health came from: a strike out of the blue; a stroke) has stolen so much. Mum sits obediently by her bed in the rehab ward when I arrive. Only when I get there can she move with greater independence, our arms linked. Heads bowed to gossip and whisper and laugh. She is not allowed to walk without help – but she can walk. To all intents and purposes she looks well, pale and thin certainly, but less ill than many of the other patients in this rehab facility for people whose brains have been broken by trauma. Many are wheel chair bound, some cannot articulate to speak, a few battle to eat and swallow safely. Mum’s stroke has manifested with an extraordinary subtlety and exquisite cruelty; she can no longer read. Not because she cannot see – though her vision is impaired post stroke – but because the injury has blown a hole, the consultant said, in the bit of her brain that correlates to language and reading. And memory. Yesterday he said, ‘she will not read as well again. Ever’. It’s the first time I’ve been grateful for mum’s short term memory loss; I hope by today she has forgotten what he said – with necessary, professional terseness, none of his words dressed up to look less bald. Words, books, have always been mum’s salvation and especially as a buffer to the worst days of a depression. She was able to step into somebody’s else’s story when her own became too difficult to bear. When she just had to put it down for a bit. But I will not believe mum won’t’ read again. I have watched her improvement over ten days; her quickening of letter recognition, and once the letters are strung together her swift retrieval of the pattern’s attendant word. And she can – bizarrely – still write, beautifully. I have to be able to read again, she says, imploring. The doctor says she won’t. I want to weep. But I set my jaw and I tell mum, we can fashion crutches, we can set up props, we will have you reading again, perhaps not as fast, perhaps not War and Peace, but reading so that you can lose yourself happily when you need to. Mum smiles at me and then she gestures to the lady in the bed next to her, who can read but who cannot speak or walk, ‘I feel so sorry for that lady, whose name I cannot remember’. And I gaze at mum, stoic, outward looking, courteous, kind and I think, ‘this is my well mum’. This is my well-sick mum.